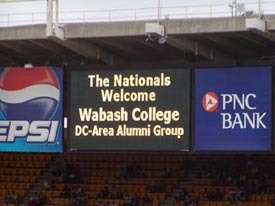 National Capital Association of Wabash Men board members Marc Nichols '92 and Rick Strasser '02 organized an outing on Saturday, August 27 at a Washington Nationals game where 35 alumni, friends, and family gathered to watch the Nats and Cardinals. All reports indicated a great time was had by all even though the Nationals lost the game. Even the fans, seated behind the group, from Montreal, speaking mostly Canadian French, who traveled to D.C. and rooted against the former Expos didn't affect the Wabash crowd. By going through the group ticket office the group even got the College name and alumni association name in lights at RFK Stadium. Thanks to Marc and Rick for handling the arrangements and to those that joined them for the game. The NCAWM will next host members of the Wabash Political Science Department faculty on Thursday, September 1 as they visit Washington D.C. for an annual conference.